After a vehicle is repaired: (body, paint or mechanically) If there is a doubt in the repairs quote or on the quality of the repairs, one of our selected inspectors can determine whether the subject vehicle has been repaired to manufacturer specifications. If a vehicle is damaged, we can identify the extent of the damage and evaluate the amount of the required repair. 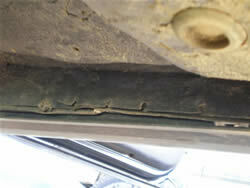 2004 Holden UTE after our inspection: The vehicle was not repaired correctly and had a dangerous inner sill panel which was not welded by the repairer.